It's mid-July. Do you know where your swimsuit is? And if you find it, would it fit? Toronto, Canada, July 15, 2008 - A Statistics Canada survey released last month shows that 32 percent of Canadians are overweight. Toronto fared even worse, with 40 percent of the adult population packing on too many pounds. Worldwide, 1.6 billion are overweight. A solution is urgently needed. is a revolutionary new book that gives you the tools you need to lose excess weight and achieve total wellness. Visit http://www.edgarcaycediet.com . The Edgar Cayce diet eliminates the predominant cause of overweight-an excess of processed and starchy foods in the diet. Centered around natural whole foods and alkaline-forming vegetables and fruits, the Cayce diet optimizes all metabolic processes and thereby helps build a leaner, healthier body. Did you know that your body can burn fat even while at rest and that certain foods and food combinations enhance this natural process? "The nutrient-dense components of the Cayce diet synergistically support the body's fat-burning potential and help to balance the endocrine system, which plays a key role in weight management," says author Simone Gabbay . "Cayce's suggestion that the regular intake of grape juice, diluted 2:1 with water, achieves a metabolic reconditioning, provides an additional weight-loss tool." Paralleling the recommendations from the Cayce material with modern scientific findings, the book also examines why proper sleep, exercise, and a positive stress response are critically important for achieving and maintaining weight loss. Learn how you can walk off excess pounds and keep your metabolism optimally tuned. 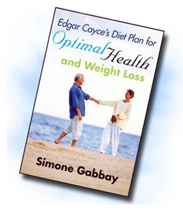 Featuring a selection of delicious recipes and practical tips for implementing the nutrition and lifestyle principles outlined in the book, Edgar Cayce's Diet Plan for Optimal Health and Weight Loss is as much a revolutionary weight-loss program as it is an educational guide to health and wellness for life. Simone Gabbay, RNCP, is a holistic nutritionist in Toronto, Canada, who has studied and worked with the Cayce material for more than 30 years. She is the author of two previous books on diet and health, both published by A.R.E. Press. She writes two regular magazine columns and is a frequent contributor to major Canadian health publications. Visit her website at http://www.simonegabbay.com.